Seahorses are hard to find and they are one of the favourites to spot by most divers. These super photogenic little creatures are considered by many to be one of the cutest animals in the underwater world. They have been known for centuries and their scientific name Hippocampus comes from the ancient Greek “hippo” meaning horse and “campus” meaning sea monster. Apart from being super cute sea creatures, this unique little animal has some of the most interesting life cycles and behaviour patterns. Seahorses vary in size, with the average seahorse being around 10 to 12 cm in length. They have a series of bony plates that act as armour covering their body in a series of rings. Uniquely amongst fish, they and the razorfish/shrimpfish are the only two animals that swim in an upright body posture. They are very poor swimmers and tend to prefer spending their time anchored to the bottom somewhere. When they do swim, they awkwardly flutter their dorsal fin, and use a pair of pectoral fins located behind their eyes to steer themselves. In fact, the fish with the worst swimming technique is the dwarf seahorse, with a top speed of a whopping 1.5 meter per hour. For an animal that spends most of its time anchored to something, seahorses are quite adept at spotting predators. To achieve this, seahorses, like several other creatures, can move each eye independently – giving it a much bigger field of vision. Seahorses have a very complicated courtship ritual that lasts for several days. During the initial “getting to know each other” phase of the courtship, the partners swim side by side holding tails, grip the same strand of seagrass and swirl around it in unison, and they may even change colour during the process. At the end of this phase, the partner begins a “true courtship dance” which commonly lasts up to 8 hours. During this mating process, the male pumps water through his pouch, inflating it and opening it up to the female, so she can see that it is empty and ready to receive her eggs. When ready, both partners release their hold on any anchors and drift up in the water column snout to snout. The female then deposits her eggs in the male’s pouch. Male seahorses have one of the most unique and interesting reproductive roles in the world – for even most dedicated male parents in the animal world tend to leave the breeding, laying eggs, and giving birth to the female before taking care of the brood. Not the seahorse super dad! 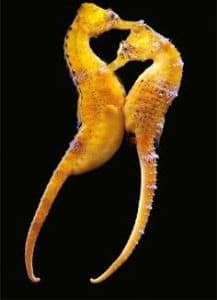 During mating, it is the female seahorse that deposits her eggs in the male seahorse’s pouch, who then fertilises them with his sperm and incubates them for up to 3 weeks, thus effectively becoming the only male on the planet to get pregnant. The dedicated seahorse father carefully monitors the salinity of the water in his pouch to ensure it does not vary too much from the outside water salinity – to ensure a healthy development of his offspring. The plucky seahorse father gives birth at night, in a process where he pushes out his offspring with muscular contractions. On average, they give birth to a litter that ranges from 100 to 1000 individual seahorses. 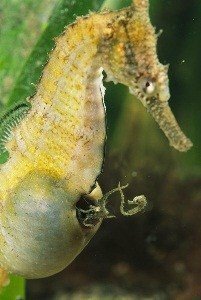 Seahorses are such dedicated fathers that they are normally ready for their next batch of eggs the morning following the birth of their litter. 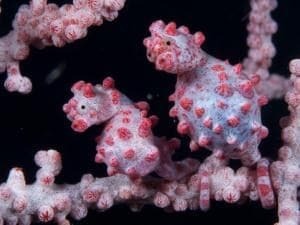 One of the more unique species of seahorses are pygmy seahorses. For an animal that on average is about 10 cm long, to have a pygmy variant is quite special. These seahorses grow to between 1 to 3 cm and are truly masters of camouflage. They live much deeper than traditional seahorses, and tend to inhabit the 20 to 40-meter depth range. They primarily live on gorgonian corals and are one of the most difficult little creatures to spot – if you do manage to spot one, consider yourself one very lucky diver indeed. Seahorse and their cousins Sea Dragons are very adaptable creatures, they evolved to adapt in different environment. 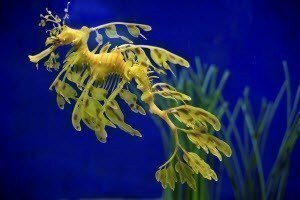 You can see on the Amazing adaption of the Leafy Sea dragon to match the surrounding seaweeds, making them very hard to find for predators. Most seahorses are found on seagrasses from a depth of 5 to 20 meters, the exception to this is the tiny pygmy seahorse which lives at deeper depths. Seahorses are ambush predators, feeding on small crustaceans and small invertebrates who pass within their reach by sucking them up their tubular snout. Sea horses are hardy creature and are pretty much found in everywhere except the polar regions. Although they are everywhere they are generally not found in great numbers anywhere. What is the best place to see Seahorses at the Smiilan? At the Similan islands national park the best place to see the seahorse is Richelieu Rock, where 2 yellow Seahorses are residence. Unfortunately, seahorses are another animal that is plagued by being an ingredient in traditional Chinese medicine. They are used to treat impotence, pain and induce labour. Due to the growing demand for Chinese medicines, it is estimated that up to 20 million individual seahorses are taken every year to supply this trade. Additionally, seahorses are also consumed in Indonesia and parts of the central Philippines. Have we learned anything else from seahorses? Yes, the ubiquitous seahorse tail is being studied by scientists. Since a seahorse tail has to be flexible enough to be used to hold on to delicate objects, and yet be strong enough to protect the animal from predation, this has led armour designers to study the tail armour plates of seahorses. This could lead to a big leap in the design and development of body armour for soldiers. Generally, seahorses inhabit grassy patches of the sea bed, and while you may be tempted to zip over a grassy patch to get to the next colorful coral pinnacle, it is worth your time to take a very slow trip over the grass paying close attention. Not only does this make it possible to spot seahorses lurking in the grass, you will probably also spot many other wonderful little critters that live in sea-grass.